Sen. John Kerry thanks his 1,393 interns who worked for him during his time in the Senate. There you go: Kerry: "I thank the reporters." Kerry: "I do feel a certain wistfulness about leaving the United States Senate" as opposed to those who have left in frustration. "I do not believe the Senate is broken, certainly not the institution." Says there is nothing wrong with the Senate that cannot be fixed by what's right with it. Kerry: "It's not the [Senate] rules that confound us, it's the choices people make about those rules." Sen. Chambliss (R-GA) questions Hagel on Iran, "red lines" in particular, as does Sen. Udall (D-CO). 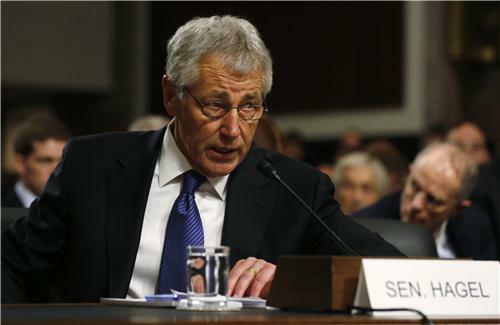 Hagel stresses that military and all options must remain on the table. Hagel: “I’ve had more attention paid to my words in the last 8 weeks than I ever thought possible, so I don’t take any chances." Hagel says that "quiet, insidious" threats to cybersecurity are the biggest facing the nation. The Vietnam Veterans of America are here, handing out a statement "fully and unequivocally" supporting Hagel. Here's the press release from the Vietnam Veterans of America supporting Hagel, first released on Tuesday. Ayotte also repeatedly interrupts Hagel, like McCain and Inhofe. Manchin - a Red State Democrat - is up next. Starts by saying Hagel brings a "breath of fresh air" to this process. Manchin, a conservative Democrat in a divided congress, said he wishes he had served with Hagel - as a senator who worked across the aisle. Levin asks that videos be transcribed for the record, says that he told Cruz that videos screened without transcript at hearing is "unusual" was permitted provided that all text and content is made available to Hagel and the pubic. Whatever the merits of the questions, this hearing isn't Hagel's finest hour. I'm in the room and Hagel is not coming across all that badly. He's calm and emphatic.He's stumbled at times, so have some questioners. There are only about five senators here right now - Sen. Levin is recessing for about an hour so that senators can vote. Levin announces recess for "about an hour" for series of votes, including final debt ceiling vote. Reflecting most unfortunate participant in Hagel hearing so far is Cruz aide who had to hold his sign. Not saying Hagel's been great - he's worst of 3 hearings of past couple weeks - Clinton and Kerry were better. White House Press Secy. Jay Carney: Suicide bomb incident at U.S. embassy in Turkey "is clearly an act of terror." In Farewell Address to State Dept personnel, Secy of State Clinton says: "I am very proud of the work we have done together." Clinton tells staffers she expects them to be as focused & dedicated for Secy of State Kerry, as they've been for her. "I will miss you,": Clinton tells staffers. "I will probably be dialing 'Ops' just to talk," she jokes about calling the Operations Center. WASHINGTON, Feb 5 (Reuters) - The U.S. government is seeking more than $5 billion in a lawsuit against rating agency Standard & Poor's over mortgage bond ratings, U.S. Attorney General Eric Holder said on Tuesday. The civil suit against S&P and its parent McGraw-Hill Cos Inc is the first federal enforcement action against a credit rating agency over alleged illegal behavior related to the 2007-2009 U.S. financial crisis. U.S. Attorney General Holder says there's "no connection" between S&P downgrade of U.S. and investigation into S&P ratings of mortgage products. WASHINGTON - The U.S. immigration system is badly in need of reform but Congress should not rush legislation to President Barack Obama, who is demanding prompt action, a leading Republican said on Tuesday. In the first of a series of hearings planned by the House of Representatives Judiciary Committee, Chairman Bob Goodlatte warned a packed hearing room that his panel "needs to take the time to learn from the past so that our efforts to reform our immigration laws do not repeat the same mistakes." Obama and many of his fellow Democrats in Congress are pushing for passage this year of comprehensive reforms that would include putting 11 million illegal residents on a path to U.S. citizenship. Reuters: CIA Director Nominee John Brennan says he was interviewed in connection with U.S. prosecutors' probes into unauthorized leaks of government information. According to official documents, Brennan told the U.S. Senate he was interviewed a spart of probes into leaks concerning cyber attacks against Iran and a foiled bomb plot tied to al Qaeda in Yemen. Reuters: Senate panel could hold hearing to consider Jack Lew to serve as treasury secretary as early as February 13, source says. Senate Armed Services Benghazi hearing about 2 hours in. We expect a 2nd closed door hearing after this. Graham (R-SC) keys in on Panetta's and Dempsey's conversations with Obama during the attacks, both state they spoke with the president one time each. Graham, on response to attacks: "Was one airplane launched anywhere in the world to help these people?" Confirms that Panetta did not know how long attacks would last, focuses on whether "any DoD asset was put in motion" before the attacks had ended. Dempsey says "I would call myself surprised" that Clinton did not know about Ambassador Stevens's cable questioning Benghazi security. Levin starts second round of questioning, which is bound to be cut short by votes and upcoming hearing on John Brennan's nomination for CIA director. Levin makes distinction that even if Panetta/Dempsey only spoke directly with Obama once in attack's aftermath, there was more indirect contact and meetings with staff. Here's the release from Feinstein's office on her joint statement with Levin (PDF) about the effectiveness of EIT, in particular during the bin Laden operation. Brennan on torture: “I am not a lawyer or a legal scholar to make a determination about what is in violation of an international convention"
Sen. Coats joins other GOP Senators in accusing Brennan of releasing sensitive information to press.